A New Lake Merritt Dog Park? The old police horse stables site is to be explored as a possible alternative to the controversial Lakeview Park plan. 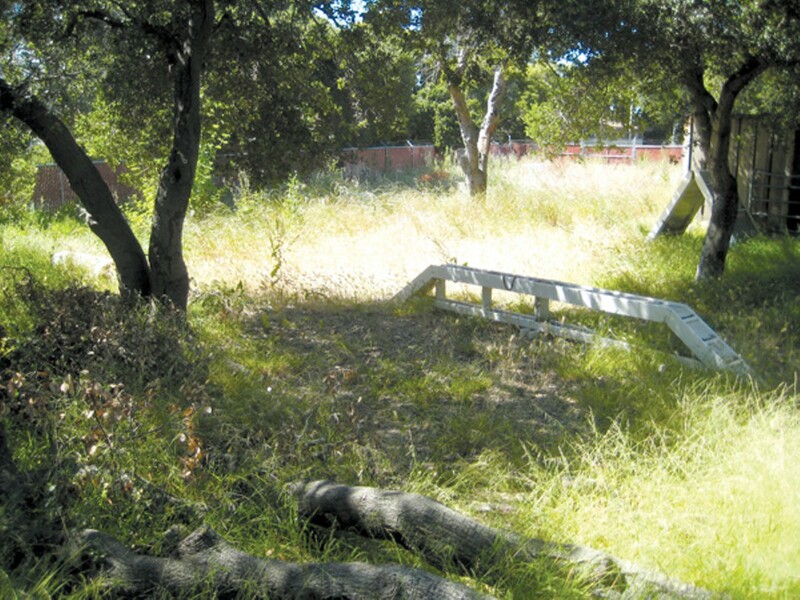 A new plan would create a dog park on a wooded hilltop behind Children's Fairyland. The debate over the proposed dog park at Lake Merritt just got a lot more interesting. For years, residents have been led to believe that the only possible location for the fenced dog run was a lawn near the lake's northeastern corner, where MacArthur Boulevard and Lakeshore Avenue meet. That's precisely what has made the project controversial, with many residents arguing that the site's high visibility makes it inappropriate for a dog park. Proponents, including Councilwoman Nancy Nadel, have insisted that there is no other option. But an alternative site has surfaced that has the support of Councilwoman Pat Kernighan and appears to be favored by both Public Works and Parks and Recreation. Discovered by Kernighan's office in the spring but only recently revealed, the proposed alternative site is sparking a fresh round of discord on online forums. It's located further west down Grand Avenue, behind Children's Fairyland and due west of the Lake Merritt Band Stand. The wooded hilltop site is the former home of the Oakland Police Department's horse stables, a remnant of the days when police patrolled the lake on horseback. The ex-stables are choked with grasses and weeds, with the exception of a small area used occasionally for police-dog training. The majority of the area proposed for a dog park is already enclosed within a six-foot-tall chain-link fence. Best of all, proponents say, it's quiet, shaded, and sufficiently obscured that many regular park visitors may not even know it exists — all while offering views of the lake and downtown. "The main improvement is that it doesn't take away an open space that's currently in use, and that it's shielded by trees and shrubs from view," said Councilwoman Kernighan. "It does not pose an aesthetic problem, and it doesn't take away any open space. ... I think it's a better choice." And so do city staff in both Parks and Recreation and Public Works, she said. After being tipped off to the site by a member of Kernighan's staff, Luka's Taproom & Lounge co-owner Maria Alderete decided to run with it. An avowed dog lover who named her business after her late dog Luka — and who lives in Cleveland Heights, closer to the original location — Alderete nonetheless opposes the controversial plan proposed by the Oakland Dog Owners Group at the east end of the lake. Recognizing the community's need for a dog park, however, Alderete decided to be proactive. She ended up working with Brad McCrea, a member of Save Astro Park, the group that has led the charge against the original proposal, to draw up formal plans for the alternative site and submit them to Parks and Recreation early last week for a formal design review. "We're not against dog parks," Alderete said. "We're just against fenced dirt areas at the gateway to Lake Merritt. ... The community was told that the Lakeview site was the only location. They don't even know that there is this other site." At its meeting on Wednesday, July 13, Oakland's Parks and Recreation Advisory Commission will hear a presentation from a member of Alderete's team and decide whether or not to move the design proposal along to the next step, which is applying for a conditional use permit. At the same meeting, the eleven-member commission will review a minor conditional use permit application already prepared by Parks and Recreation for the original location. If approved, the city planning office will post signage at the park noticing a seventeen-day public comment period before making its final ruling on the Lakeview Dog Park proposal, which has been in the works in various guises since 1998. The confluence of the two processes, one new and one old, makes for a curious situation. While both parks are targeted to total about 20,000 square feet, offer separate spaces for large dogs and small dogs, and could be constructed in roughly the same amount of time, the differences between them are myriad. The Lakeview Dog Park is estimated to cost $45,000, while Alderete guesses that her plan will cost around $35,000. The Lakeview Dog Park would eat into a grass lawn also used as a playing field, while the horse stables park would expand into an open picnic area. And the Lakeview Dog Park's location would allow it to best serve residents of the Grand Lake and Cleveland Heights neighborhoods, while the horse stables location is more accessible to residents of Adams Point and Uptown. More importantly, the police horse stables location appears better poised to benefit from both public opinion and Oakland's Open Space, Conservation, and Recreation zoning guidelines — which prioritize active recreation and open space preservation in the Lake Merritt area and encourage development of underutilized resources. Even though it's only just been revealed, the horse stables location already looks to have fewer obstacles before it. According to Kernighan, in a May meeting she briefed Oakland Dog Owners Group co-founder Emily Rosenberg on the alternative location and its relative merits — and offered up the chance to change horses mid-stream, so to speak. Rosenberg declined. Her organization has been working on the location at the Lakeview site for thirteen years, and, even with the zoning challenge ahead, is closer than it's ever been to having the project approved. "We've seen how much opposition has come up at Lakeview, and we can't afford to start over," Rosenberg said. "What we need to do right now is keep focused on moving this one through the public process." Still, she said that the police horse stables could make for an excellent dog park — perhaps in addition to the Lakeview site. Kernighan and Alderete say they've considered pursuing the second location regardless of what happens with the first; demand in the Lake Merritt area is likely sufficient to support two dog parks, which would provide the added benefit of avoiding excessive crowding at either location. Yet it remains too early to tell how quickly, or if at all, the police horse stables location could come to fruition. Just about everyone who's familiar with it seems to have embraced it — everyone, that is, except its closest neighbor, Children's Fairyland. After learning about the new proposal, Executive Director C.J. Hirschfield floated the idea to her board of directors. Not one of the eleven members was particularly enthused, she said. 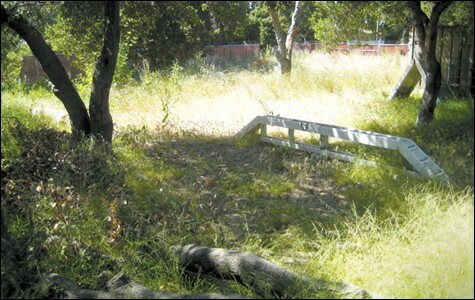 Concerns included access to the site, which relies on Fairyland's sole service road; available parking; and compatibility with the nearby bird sanctuary (Kernighan said that as long as no birds are physically harmed by dogs, this shouldn't be an issue — and that holds true at both locations). The board was also concerned about combining small kids, strollers, and dogs in one place — which is likewise a critique of the Lakeview site, as it's located directly next to a children's play area. Save Astro Park member Steve Saffold said his group's primary goal is protecting the open space that would be lost under the proposed Lakeview Dog Park plan. But its members also have identified and measured a dozen alternative sites around the lake, and agree that the police horse stables present the best solution. "This is the one that far and away has the best combination of attributes," he said. "This location has it all."